Sometimes, a product comes along that ticks all the boxes. 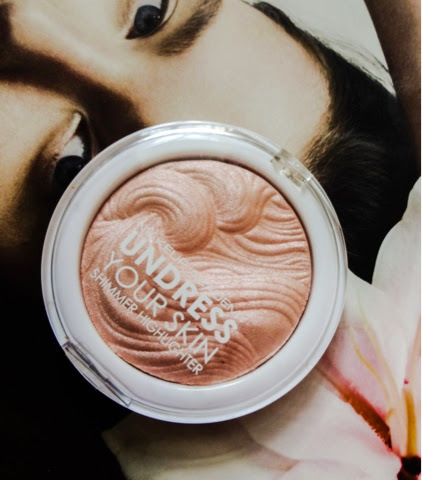 And its even better if this product happens to be affordable, so I'm overjoyed with MUA's Undress Your Skin shimmer highlighter. I've passed this over many times without picking one up, but lately I've been feeling the need to get my glow on. It's such a flattering skin finish, so I'm always seeking out products that will bring light to the face and give my skin a youth boost. 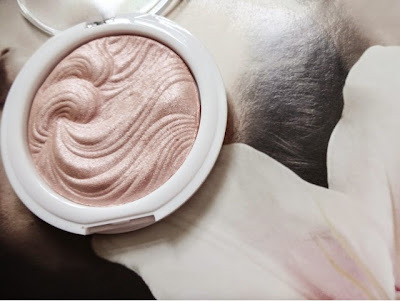 I started looking for a drugstore alternative to Mac's Mineralise SkinFinish in 'Soft and Gentle' and came across this little marvel. 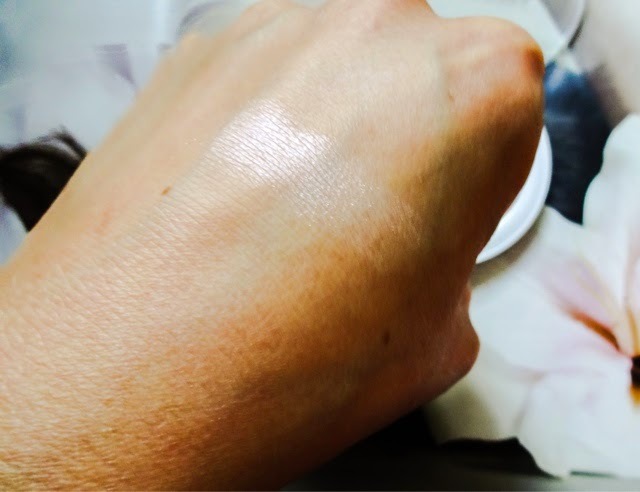 Inside the neat white compact is a gorgeous, iridescent powder. The tone of it is a peachy rose colour with a multicoloured shimmer. At first glance, it just looks like a generic shimmer, but close up, you can see the particles are made up of lots of different colours, and I think its this that makes the powder's effect so luminising. 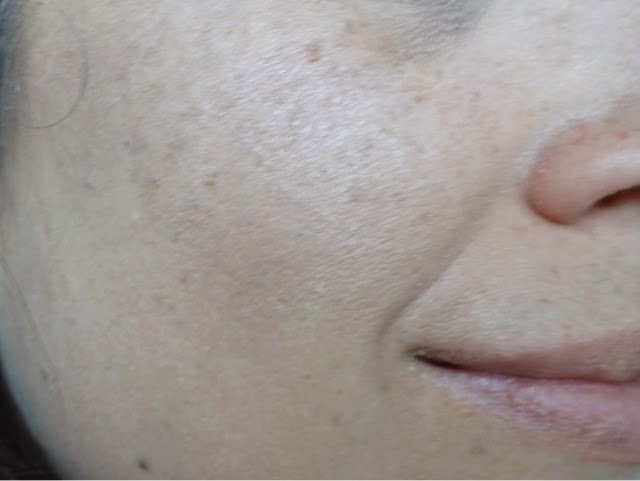 I have warm-toned skin, so anything too 'silvery' can look wrong and fake on me (Benefit High Beam being a case in point). Undress Your Skin is a lot more subtle than this. The powder is very finely milled and the illuminating effect it gives is nice and natural, helping to achieve that coveted 'lit from within' look rather than looking 'glittery' in a obvious way. It's hard to overdo it with this powder, which helps. I've taken to using it as the final step in my daily make-up routine, using a large, fluffy powder brush to sweep it over my forehead, nose, chin and the tops of my cheekbones. This gives a lovely, soft diffused glow to the face that is subtle enough for everyday and just perks the skin up and makes it look younger and brighter. As the days gradually begin to get shorter, this is also a must for dull, autumnal skin. The swatch is to give an idea of the colour when it's densely packed on. You can see that it gives a really flattering sheen to the skin. The quality of this product is so good as well, I can hardly believe its only £3.00 - what a treat! And guess what? The top four ingredients in this are exactly the same as the Mac Mineralise Skin Finish powder, so you really are getting a quality product for a fraction of the £20 you'd pay at Mac (much as I love them). It's a baked powder, which allows for a really rich shimmer. It looks so good on top of blusher or bronzer, really helping to bring dimension to your skin as well. This regualrly sells out and I can see why - I'd be distraught to be without it now. Above is a shot of it on the skin - it looks really natural and flattering. 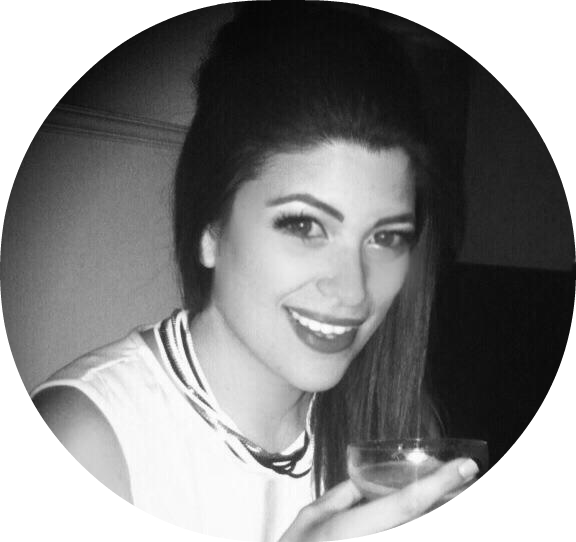 Its also good to pop some at the inner corners of your eyes if you've had a long night because it just perks up and enlarges the whole eye area. With just a bit of BB cream it makes skin look natural, rested and energised. 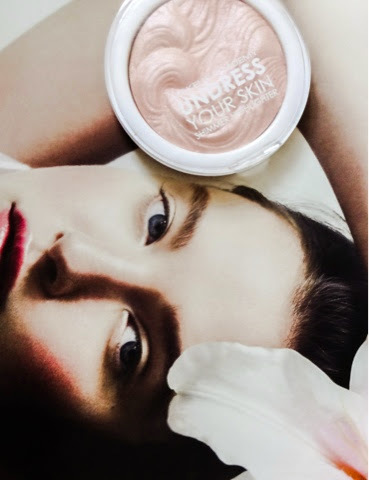 Usually, even with the best formulations, drugstore products can sometimes be let down by their less than desirable packaging, but Undress Your Skin comes in a simple white and clear plastic compact that looks fine even staked up against your high-end products. The clear lid showcases the product itself, whose pretty colour and beautiful sculpted 3D waves look more Lancome than lame. I feel like I'm at the beginnings of a love affair with MUA. After trying the 'Undress Me Too' eye palette (a flawless dupe for the Urban Decay Naked 2 - see my review of it here) and now finding a new must-have with the highlighter powder, I'm falling for its charms. 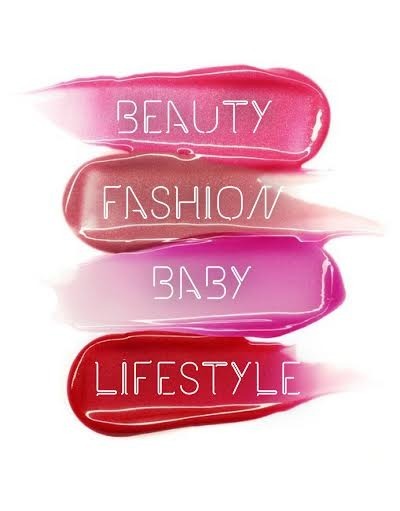 The products I've tried are amazingly high-quality, to the point where you couldn't tell the formulations apart from much more expensive brands. And there's nothing quite like the thrill of discovering something to-die for at a price you couldn't even buy a latte at. The Undress Your Skin range also includes a primer and a BB cream, which I'm now thinking I've got to try as well. So, if you're addicted to heaven-sent, glowing complexions straight out of a fairy tale, you simply must give this one a go.